Big trade for the Habs..
A good trade for both teams, IMHO. Only got to listen to a couple minutes so far of Hebsy's podcast, but man - that sounds like a really, REALLY good listen. It's like Behind The Music "Mark Hebscher Style". Can't Wait! And as the host of the Kicks out the Jams! series, it's a helluva lotta fun. Wilner is next on Tuesday. 2017 Hockey Hall of Fame announcement upcoming June 26. I'd select Selanne (duh), Recchi (577 goals), Kariya (point a game player in dead puck era), and Sergei Zubov (vastly underrated in an era where Lidstrom dominated the position). I'd also love to see a more public display of the balloting process (even the names of those nominated are kept private, not to mention the vote totals). So Lanny, if you're reading this, get on it. Zubov was great, but I never considered him a hall of famer. Not sure I thought of Recchi as one though, either. After the random election of Rogie Vachon last year, the door remains open for that kind of "WTF" result you'd definitely never get in MLB. Fun discussion fodder, though. Recchi, for example, seems like a Joe Carter to me... and Joe isn't a hall of famer, just a guy who put up big numbers for a long time. 3. What's the best movie in theatres right now? I found the open Mike today. That's good. I'm not first, but I don't care. How about those Indians. They won. That was a great game. Josh Tomlin pitched well. Edwin Encarnacion and Lonnie Chisenhall hit homers. Edwin Encarnacion is heating up. My Orioles didn't do very well again though. That's no good. They had to lose again. They have to start turning it around. I hope the Habs trade will be good. They will win the cup. It will be either them or the Coyotes to win the cup next year. don't know if it's the best of all films out, but I've seen Alien: Covenant twice now, and much like the star wars re boot, it's basically everything the doctor ordered for fans of the Alien universe. I didn't mind Prometheus either, and originally Ridley Scott was going to move further away from featuring actual Aliens (ie Xenomorphs), but he eventually decided to just give fans what they wanted while trying to explain the backstory that leads up to the 1979 film. I believe there's one more coming that will bring us to the start of that one. Scott's certainly trying to add some intelligence to it all, rather than just the usual schtick, although, at the end of the day, it's the same basic premise re hashed. More than anything though, i quite liked the tone and production design - certainly had Scott's touch. I saw "It Comes at Night" last week. If you like thrillers, I've seen worse. Frig, didn't sign in AND I @ the wrong poster. Have a great day, all. @Anonymous - yea i was curious about that one. May check it out. For shits n giggles i watched The Human Centipede on Netflix one sunday morning, aka throwaway time. If any of you have access to Viceland, Dead Set on Life isn't a bad show with Matty Matheson who owns parts and labour here in Toronto. Might be a good candidate for 1 of your podcasts Mike. He's a bit of a maniac and a big fella, and had some serious coke and booze problems a few years back, which led to a heart attack at 29. It's a bit of an act he puts on but seems like he's probably a pretty good dude. One thing that drives me nuts though is the music in his show intro - i have to mute it everytime. All 5 members of the Tragically Hip will receive the Order of Canada, Gov. Gen. David Johnston announced Thursday. Does anyone here feel that if Downie was not terminally ill, these guys would never really be considered for such an honour? No like or dislike, but there are Canadians who have actually attempted to better Canada without the window dressing that a "band" like The HIP have used in the past few years. Mike, one could possibly even nominate someone like yourself who has taken the time to give Canadian Talent a free form forum to discuss Canadian values over people like the Hip, as you are doing this for pleasure, where they have done what they do for personal enrichment and fame. @ Aldo: io agree with Ryan G. Alien covenant was fantastic. If you are a fan of the alien movies you can see how it's being setup to feed into the original Alien movie. It's dark a bit gruesome, but smartly done with expansive scenes and filming. Only negative thing about it is that there was plans for a 3 origin movie and that 3rd movie has now been cancelled... Which if true leaves things feeling a little incomplete. If you are looking for an easy no thinking required movie then you can't go wrong with Wonder Woman. Nice easy super hero movie, and only a little bit of cheese at the end, otherwise I feel I got more than my monies worth. Then there is the Guardians of the Galaxy, but I've left both movies now feeling as if they are a bit overrated. This second release I did enjoy more than the first though. If you liked the first one then you will most definitely enjoy this one. I really wasn't a fan of it comes at night, was fully prepared to walk out half way through the movie. I'd put a vote in for Both Wonder Woman and Guardians although I'd say #1 was better. #2 was a little schmaltzy but still fun. yikes, not like i want to agree with @VOR :) but i really do agree. im not saying the hip haven't done their share for Canada and its issues but there are MANY MANY more deserving people. sadly i think it is due to Gord's illness. ps - i am neither a fan or non-fan of the band. And The Hip are eventually getting the Order of Canada anyway, why not do it while Gord can still attend? So you are fine with The Hip making this event about them and placing more deserving recipients in the shadows? @VOR: You are reaching with that last statement. Holy crap, that turtle Toronto Mike photographed yesterday was YYYUUUUGE. Did someone free a former pet or something? Never seen anything close to that size in the wild. That was the largest turtle I've ever encountered in the wild. I was biking through King's Mill Park yesterday and it was beside the trail. Note re: receiving the Order of Canada. If you've done something that qualifies you to receive some form of the Order of Canada (Companion, Officer or Member), then it really is only a matter of time, and also a matter of being nominated by someone, before you receive the honour. "The Order recognizes people in all sectors of Canadian society... they have all enriched the lives of others and made a difference to this country." Also, it is not as if the Hip were the only people nominated this year. Each year dozens of people are admitted to the Order. Even if you don't like their music, it should be easy to see how the Hip qualifies to be included in this list, given their long, successful career and extraordinarily Canadian oeuvre. I would say that this year, perhaps knowing that his time is limited and wanting to leave an impression beyond music, Gord Downie has done a lot to raise awareness for indigenous people. The Chanie Wenjack Fund has done a lot, and Gord, despite being very ill, has been doing a lot himself to raise awareness for this. If he were doing this, even if he weren't ill, would still probably be getting the recognition he deserves. It would be so easy after the last Hip concert last August to just retire and relax until his time comes, but he has been out there and doing a lot to raise awareness. Saying it is just because Gord Downie has cancer is insulting. I agree The Hip should be honored for their dedication to music truly Cdn. in nature for such a long time. Personally I DISLIKE their music overall - except 1song - Ahead By a Century. That's it, but still they are very deserving of Order of Cda. regardless of Gord's health situation. How can anybody negate their inclusion for Order Of Cda. Gonna be fun in next few days with NHL expansion as lots will be happening overall. Hopefully Austin wins the Calder as should be a no brainer. Crosby still NOT in my top 5 of all time. Gretzky, Howe, Orr, Lemieux, Richard, Belivieau, Messier. Sid still playing & can move up big time in future long with McDavid in the longer future. The only reason I can think of for the VOR to be down on the Tragically Hip receiving the honour is that he or she has done something for which he or she feels is deserving as well. Let us know what it is, sir or ma'am, and let us decide if you are worthy. I nominate that King's Mill Park Turtle for the Order of Canada. I still can't believe how a turtle that big is in a metropolitan area, what a gentle giant. Well, how about those Indians. That was a great game. They won. How about Edwin Encarnacion. Another home run. Now he is hitting them all the time. Anyway, my Indians are on a roll, but too bad about my Orioles. My Orioles lost another one. Also my Diamondbacks won as well. A home run by an unlikely source, Gregor Blanco. My Indians and Diamondbacks are doing great, but my Orioles not so good. Re: Your comments about the Hip. You Probably have no idea how much they give back to the community in so many different ways because they don't look for public acknowledgement. They are very humble people who want to make a difference, they have used their influence to make this a better place for countless people in need. It's predominantly this reason why the are receiving the Order of Canada, not just because they are the voice of Canadiana to a generation. Still trying to wrap my head around the news out of the world of boxing. Connor McDavid is a good kid, but no match for Floyd Merriweather, even in his fifties or however old Floyd is. Maybe if they fought on skates, but even still there are other NHL'ers who could give Floyd a better fight. I vote again Mike receiving the Order of Canada. The Gemini he has is good enough. Plus, I don't think he's yet inducted you into the TM Wall of Fame! Is Elvis a guest or co-host? Once you solve this riddle, all will make sense. As co-host, could he be enshrined in the 'Builders' wing? Terrible storm here for 2 hrs. Heavy rain & high winds. Now the sun is out. Happy Fathers day tomorrow to all U Dads. It's a good & bad day for myself from past years. My dad passed away 1 day after Fathers Day in 1991 before my kids were born & 4 years ago on Fathers Day my 1 son came home after spending 3-4 days at a hospital in the psychiatric ward with suicidal issues which I will not disclose & fortunately he realized he had a problem & texted friends who contacted us parents right away & agreed to go to with Mom or other solution was to call 911. That was the best Fathers Day gift I ever received him coming home. Thanks for sharing, hope your son is doing better. 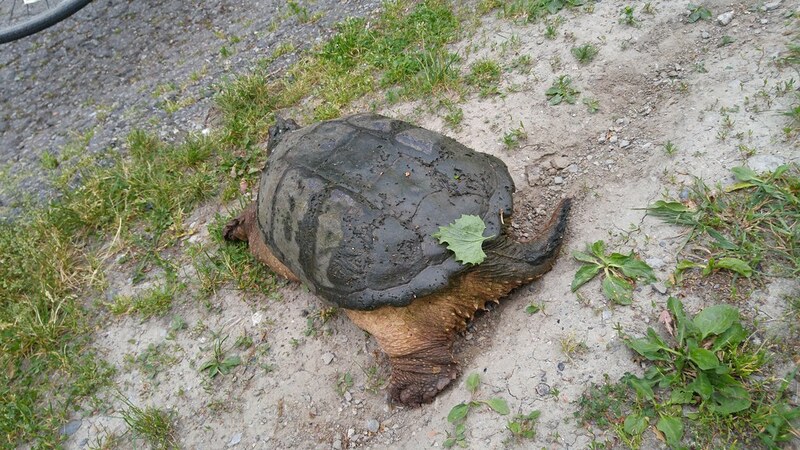 Also amazed at such a large turtle surviving in Toronto. 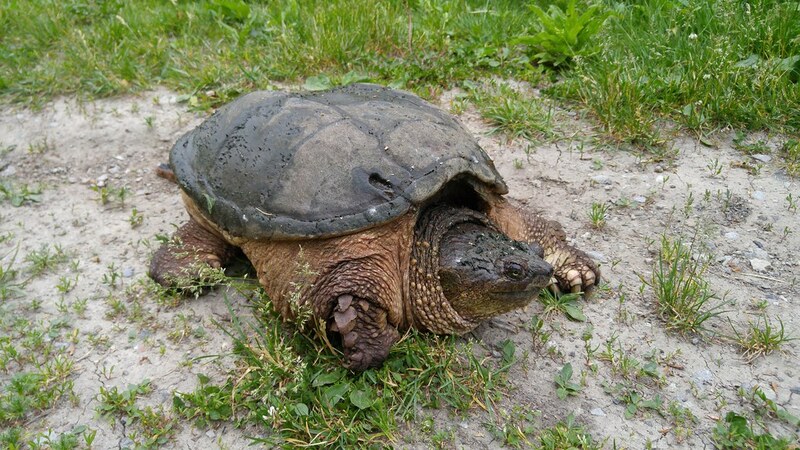 There are a number of good sized Snappers at my sisters cottage in Bancroft. We had fish on a stringer hooked to the dock, and the kids start screaming that a turtle basically made a sushi buffet out of them. We gave my son a red ear slider when he was 2 years old as a consolation to not allowing him to have a dog. This was 1991, fast forward to October 2016, when "Tommy the Turtle" passed away, yes he for over 25 years! Long after my son left home and I became his sole caregiver. My son always jokes that the dog would have passed far sooner than the turtle. Forgot to comment on the Amazon take over of Whole Foods. How big does a company need to get? Hope Amazon chokes on this. Well, how about those Indians. My Indians are in first place. That's so awesome. They won two games of the doubleheader. In the first game, Ryan Merritt was awesome. Homers were by Jose Ramirez. He homered from both sides of the plate. They also won the second game with a long rain delay. Lonnie Chisenhall homered twice and Franky Lindor also homered. My Orioles finally won a game. Lots of homers by Manny Machado, Adam Jones, two by Jonathan School, and Mark Trumbo. My Diamondbacks also won. Baseball was so awesome yesterday. Tomorrow my Indians are in Baltimore. I love both teams, but I want my Indians to stay in first in their division, so this is a tough one. I think Indians will win because they're heating up though. Been away for a while...got a lot of catching up to do. Drouin to the Habs was a good deal for both teams I think. As a Habs fan I'm hoping they can also hang on to both Galchenyuk and Radulov. I realized I made a typo in my last post. I meant to say Jonathan Schoop, not School. Anyway, the Habs will win the cup, or my Coyotes will. How about those Indians. Edwin Encarnacion is really hot now. He wasn't so good at the beginning of the year, but he's good now. He hit two homers yesterday and got an RBI single. My Orioles also won yesterday as well. Lots of homers by Seth Smith, Trey Mancini, and Mark Trumbo. Mark Trumbo is heating up as well. Also a win by my Diamondbacks. That's great. Paul Goldschmidt homered again. Now my Indians and my Orioles play each other. Orioles need wins, but so do my Indians. Indians will win, but if I'm wrong, that's okay as well. You stated "Gord Downie has done a lot to raise awareness for indigenous people." As someone with roots in the indigenous community, he really has not brought any awareness to the actual issues. Most in the community that I have spoken to about him feel he is on an end of life quest for more wealth. I have no issues with him trying to place his family in a better financial state. I wish that Mr. Downie would be open and honest with the public on that quest. Are we all agreeing to a pact where we ignore the VOR's menopausal ramblings? She needs to know we're not gonna play anymore. (Only a woman would call herself the Voice of Reason without irony, though you never know out there in Trollville). VoR's trolling is contradicted by the respect shown to Gord Downie by a number of prominent leaders in the indigeneous community. Downie's support of indigenous people is long-standing, consistent, and anything but self-serving. There are a large number of the Hip's peers and cohorts in Canadian arts and music who have used their platform to raise awareness on these issues as well. Ok, so the 'Ignore TVOR' pact lasted less than a day. As that guy Anthony used to say before he left the TM Universe in a huff: "C'est la vie." Well, how about those Indians. Well, they clobbered my Orioles. Oh well, looks like my Orioles are in a real mess, but my Indians aren't. Corey Kluber pitched a shutout. He is so awesome. Jason Kipnis and Carlos Santana hit homers. Now probably tonight the game will be closer. I think Indians will win this series, but the Orioles could come back and win the next three. My Diamondbacks didn't play last night. Downie's recent solo album and graphic novel Secret Path tells the story of an Ojibwe First Nations boy, Chanie Wenjack, who died in 1966 while trying to escape a residential school. Sid, this will be my final post on The Hip and Downie until their next grasp for the dollar. Look there is nothing wrong with capitalism (Mike even had Lou Schizas on the program). One would hope that most see through the motives (money), not that they care about the issues. Humour me by making that your last post on The Hip and Downie. Lets move on to more constructive topics. It appears The Golden Knights of Las Vegas have a real chance to place a competitive team on the ice next season. Hopefully the NHL uses this system the next time they decide to expand. I admit I am pretty excited to see what Vegas does. Sounds like its going to be a lot better than previous expansion drafts. NBA draft is coming up soon too. Would love to see the lakers pass on Lonzo Ball just to watch his coat tail riding father melt down. Well, that was close, but my Orioles beat my Indians last night. That was close though. Manny Machado hit two home runs for my Orioles. Jonathan Schoop also homered. For my Indians, Edwin Encarnacion also homered. My Diamondbacks lost a close one even though Paul Goldschmidt and David Peralta homered. Who cares about Las Vegas Golden Knights or whatever they are. It's Habs and Coyotes. Habs or Coyotes will win the cup. The Lonzo Bell situation is unique. Sort of reminds me of the Lindros draft, but on steroids. A few days ago when I turned my radio briefly for some news in the morning, it was on 1010 during a "round-table" before I switched to 680. I think they were talking about repeated tornado warnings for specific parts of Ontario, although luckily no tornadoes occurred. One guy talking was actually angry at the supposed inaccuracy of Canadian weather forecasts. Apparently he seemed to think it is somehow possible to forecast tornadoes several days ahead of time, and he said something like "they can do it in Florida". Is it possible this guy is a grown adult who does not know the difference between tornadoes and hurricanes? I'm no weather expert, but I know tornadoes are very localized things that quickly arise, and hurricanes are huge systems that develop over oceans and can be tracked for days by satellites. Remember though, the average 1010 listener believes global warming is a myth because it was cold one day last Feb. That station knows its audience. Probably Jerry Agar, I recall the roundtable, but not what was said. Well, my Indians beat my Orioles again last night. One more day when they play each other. Anyway, I think Indians will take this series. Franky Lindor homered and Carlos Carrasco pitched a great game until he loaded the bases and then Andrew Miller was awesome getting out of that jam. My Diamondbacks also won with a homer by Nick Ahmed. Taiwan Walker pitched a great game. I don't care about the Las Vegas Golden Knights. We don't need another team. Only 64 comments? C'mon, we can do better... Leave a comment above and let's keep this conversation going!